Mediums were often magicians, adept at sleight of hand and fooling the eye, as British magician William S. Marriott did in this 1910 photo, lifting a small table with his foot. 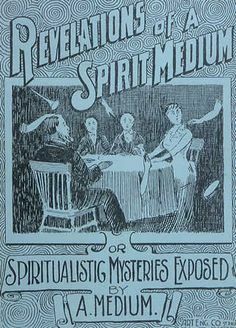 Spiritualism became popular in the mid 19th century, in part as a harmless parlor game. Its rise in acclaim was due to high mortality rates and people who looked to mediums to connect with lost loved ones. The life expectancy at that time was only about 50 years. There were many reasons for this, including lack of sanitation (wash your hands! ), diseases like measles and tuberculosis whose cures were unknown, and crude medical procedures (such as surgery with no anesthesia). Add to that the hundreds of thousands of lives lost during the American Civil War, and it’s no wonder Victorians looked for ways to cheat the finality of death. An anonymous booklet from 1891, debunking the tricks mediums used to fool people into believing they were communing with the dead. able to commune with spirits. The atmosphere worked in their favor, with flickering candles, lanterns, or gaslights, heavy drapes and dark furniture, and no camera phones to record the action taking place! They would guide the séance with questions to the spirits, who would reply by rapping on walls, tapping shoulders, and shifting furniture. Many were found to be outright frauds, taking advantage of people’s pain and loneliness to make money or gain attention. The most famous of all spiritualism stories is that of the Fox sisters from New York in 1848, who astounded many nonbelievers with their psychic powers. It was revealed much later that they used strings to lift objects, and cracked their knuckles to create rapping noises. 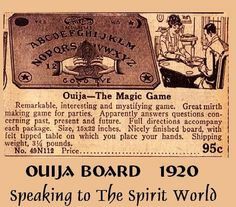 Séances got a helping hand in the 1880s when a handmade spiritualism “board” games were introduced, and patented by canny businessmen in 1891 as the Ouija Board, a game that is still sold by Parker Brother’s today. This gave spiritualism a boost by making communication with spirits quicker and easier, without needed translation of random knocks and levitating furniture by a medium. Though spiritualism was practiced throughout the year, Halloween was a great time for Victorians to bring the skeletons out of the closet (so to speak). Most gatherings on the date featured seasonal dances and parties, and included spooky games and apparitions to give guests a thrill. The October 31, 1919 Bisbee Daily Review had advertisements for those entertaining events, as well as articles for low cost Halloween party décor. They suggest using autumn leaves and goldenrods “from the country”, as well as orange and black tissue paper and “pumpkin lanterns” for best effects. You should dress up as ghosts using old sheets and pillow cases, have “diving” for apples and fortune telling wizards, and hide in dark corners and use a bellows to blow a “ghostly air” to scare your guests. Whether your Halloween is all about bagging candy or frightening friends, we hope you have a hauntingly good time! Check out Smithsonian Magazine for more information about the Fox sisters and the history of the ouija board, and see this fantastic blog by Geri Walton about Victorian Séances. You are Here: Mapping Early Phoenix – Visit us this month for an in depth look at what Phoenix looked like a hundred years ago, and how it has changed over time. You are Here is a free exhibit located in the Stevens-Haustgen Bungalow Heritage Exhibit Gallery. It is displayed in partnership with the Maricopa Country Recorders Office, and with help from a grant from APS.